DoNotSpy10 4.0.0.0 is the latest version of the popular privacy tool for Microsoft's Windows 10 operating system that gives users control over many privacy-related features of the operating system. It is a long standing privacy program for Windows 10 which was one of the first to provide that kind of functionality. Our first review of DoNotSpy dates back to 2015, the year Windows 10 was released, our second when version 3.0 of DoNotSpy was released for the Windows 10 Fall Creators Update. Attention: DoNotSpy 4.0.0.0 includes potentially unwanted program offers (PUPs) during installation. It offered to install WinZip on a test system; I had to uncheck the box to block the installation. DoNotSpy10 4.0.0.0 adds support for the Spring Creators Update for Windows 10 (version 1803) which Microsoft wanted to release on yesterday's Patch Day but did not. 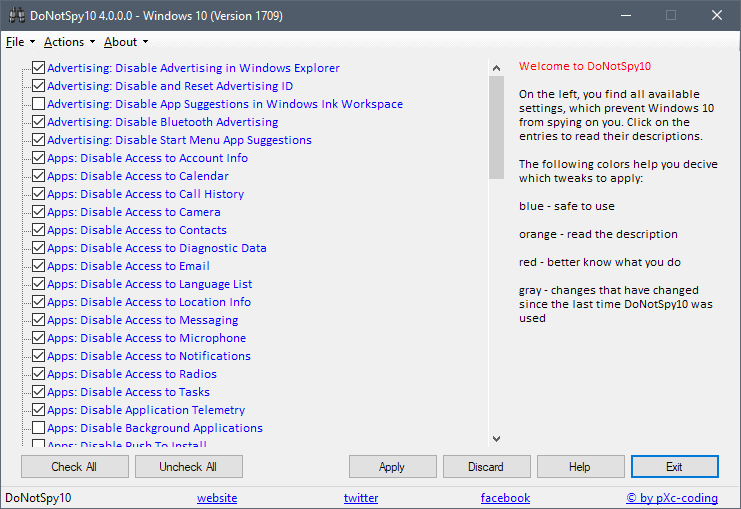 The program interface has not changed at all; the application lists available privacy tweaks in a long list on the left. DoNotSpy10 uses colors to provide safety ratings for tweaks: blue tweaks are safe to make, while orange and red require further reading as they may impact functionality. Tip: A Pro version is available that supports profiles and the following. DoNotSpy10 Pro keeps track of changes across sessions and highlights settings that have been changed outside of the program since the last use; handy if you run the program regularly as Windows 10 used to make changes to some settings automatically in the past. DoNotSpy10 is easy to use. Just check the privacy tweaks that you want to make or uncheck tweaks you want to undo, and click on the apply button afterward. A description is available for each tweak which you get when you click on it. The application prompts you for the creation of restore points whenever you click on apply and it is recommended that you create one as you may use it to restore a previous status quo. One thing that is missing is an option to reset all settings to the default level. The developer of DoNotSpy10 4.0 added several tweaks to the application and updated others. Disable Access to Documents, File System, Pictures, and Videos. Disable Publishing of user activity. Please note that some of the new settings are only available in Windows 10 version 1803 or newer. Three of them deal with the Activity History and Windows Timeline functionality that Microsoft integrated into the Spring Creators Update. You find those options under Settings > Privacy > Activity History. Disable "Let Windows collect my activities from this PC" and "Let Windows sync my activities from this PC to the cloud" if you don't plan on using the feature. DoNotSpy10 4.0 adds support for the Windows 10 Spring Creators Update so that you can control some of the new privacy related functions Microsoft introduced in the new version of Windows 10. I don't know if previous versions did include PUP offers during installation as well but, generally speaking, it is not a good idea to integrate these into your own programs especially if the offers are opt-out. Still, if you are looking for a tool to make quick tweaks to privacy settings on Windows 10 devices, you may want to give this a try. Now You: Have you changed privacy settings on your Windows machines? a PUP blocker that supports PUP during installation. i don’t trust this app. O&O ShutUp10 is the best tool in my opinion. Agree. Been around since forever and never does anything sneaky. Portable version, too. The program that is supposed to remove crapware, is adding its own crapware?! no way I am touching that. How I can get back to the old Ghacks please? Should be resolved soon. I disabled lazy loading. Do you have the problem on all pages or only on this one? I have already written Martin about my specific problem! A good program, which I think offers a bit more options than O&O ShutUp10. No need to crucify the author for the PUP offer. Instead, disgruntled users might want to learn to pay attention to what they click and support software authors for a change. @George, you raise a good point. Much of the crap that is out there can be avoided if people paid attention to what they were doing when installing software. This one is a “no brainer” for anyone who is careful. Others are less obvious. Read the whole screen. Make sure you use custom install NOT express install. Usually the express setting sneaks in crap which the custom install allows you to avoid by unchecking the option. WPD just updated, write about them or better re-review, they listen users and did a good job in the latest version. These guys deserve a good review.